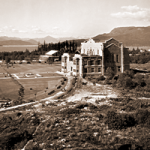 The core of the UBC Archives holdings are textual records, produced in the course of the activities of their creators, which document the history of the University and its community. These records are acquired by the Archives from the University and its constituent offices (faculties, schools, departments, and institutes); independent student, alumni, and employee organizations; and prominent faculty and alumni. With a few minor exceptions, these textual records have not been digitized. Access to them is provided through the inventories listed here — researchers must cite the fonds or collection title and the box number. The records themselves may then be examined and read in the RBSC/Archives reading room. All inventories are in .PDF format, requiring Adobe Acrobat or Adobe Reader. N.B. More comprehensive listings of photographs, audio recordings, and films and videos are available elsewhere. Researchers are reminded that access to institutional records (that is, records created or maintained by University offices) is governed by Freedom of Information and Protection of Privacy (FOIPOP) legislation. Requests to access institutional records (indicated by: ***) must be reviewed by Archives staff or by the University’s FOIPOP Coordinator. In some cases, a Research Agreement also may be required. Non-UBC records and private archives are open to researchers, subject to donor-imposed limitations. However, researchers are strongly advised to check with the University Archives regarding permission to publish or otherwise use such materials. Retrieval time for archival materials can be reduced by calling or e-mailing a day or two in advance. This gives staff time to pull the requested material from storage and have it ready upon the researcher’s arrival in the Archives office. Archival material is arranged and described as either fonds or collections . A fonds consists of the records (textual, photographic, audiovisual, cartographic, etc.) created or acquired and maintained by an individual or an organization in the natural course of his/her/its activities. A collection is an artificial accumulation of documents, gathered by an individual or an organization, devoted to a single theme, person, event, or type of record. Unless stated otherwise in the index, records held by the University Archives are maintained as fonds. Entries for collections list the name of their collector.